I had one of the best lunches I have had in a while at a little shop in Lake Mary called That Deli! I really wasn’t sure what to expect other than a sandwich when I got in there…but once I started looking over their menu I found myself having a lot of trouble narrowing down what I wanted to eat. This place has so many awesome sounding sandwiches and salads…I ended up ordering the Looney Shrooms on a spinach wrap. I can’t tell you how good it was. That was Friday. On to Saturday…all I wanted for lunch was another Looney Shrooms wrap. Lucky for me, I had most of what I needed to try to recreate it at home. It was missing the yummy garlic mayonnaise, yes, but that was okay with me…I can usually do without mayonnaise. 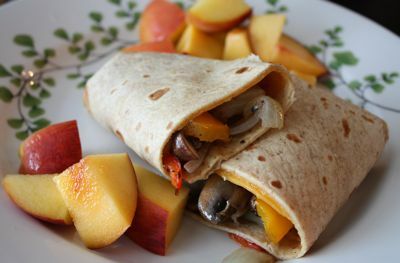 What I loved about this wrap was all the roasted veggies and their flavor. It was filling, yet light since all it is is veggies! And that’s what I wanted since it was a Gator Game Day and I was going to be indulging in beer and burgers later on. 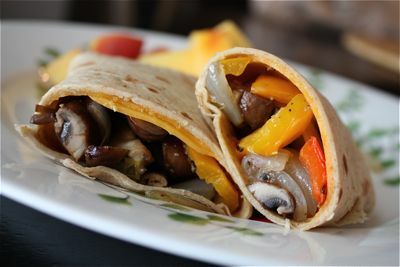 I used a tortilla wrap from La Tortilla Factory…these guys are so good for you! They are made with whole wheat and if you are trying to get some extra fiber in your diet, these babies have 7 grams per wrap! I used some thinly sliced cheddar cheese in my veggie wraps, but go ahead and shmear some hummus on them for some extra protein! Preheat oven to 400 degrees. 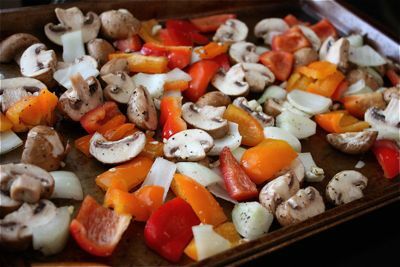 In a large bowl, toss mushroom, peppers, onions and garlic with olive oil, salt and pepper. Spread on baking sheet and place in oven. Bake for approximately 20 minutes or until vegetables are softening and starting to brown. Place 2 thin slices of cheddar cheese in center of wrap. 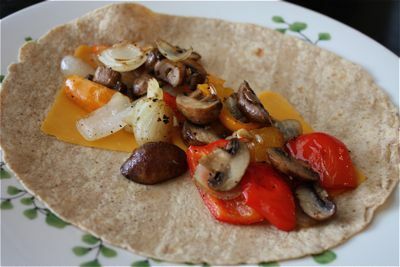 Spoon roasted vegetables in center of wrap and on the cheese. Tuck both sides in and roll wrap like a big cigar. Cut in the center. Serve with fruit for a light and healthy lunch or dinner! Looks FABULOUS Aggie. Something about cooked veggies in just a little olive oil is just so yummy! 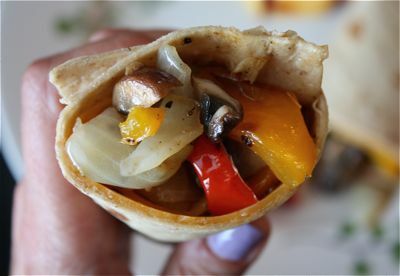 I love anything with roasted veggies – your wrap looks tasty. What a great wrap! I love mushrooms and peppers together. That’s a great wrap idea Aggie and so healthy. I love roasted vegetables. Thanks for another great recipe for me to add to my list. mmmmm, what a perfect lunch! i’m going to buy the ingredients for this next time i go shopping, delicious! Looks yummy! Everything I love in it – has to be good! Aggie, This looks great! Very nice pictures as well! 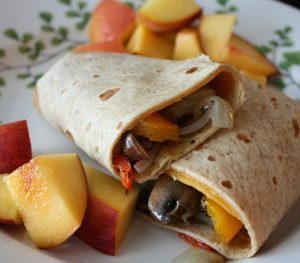 This is my kind of wrap – yum! And 7g of fiber per tortilla is awesome, I’ll have to look for those! Yum, that sounds so tasty! I wonder if I could make it work with Pita bread? This looks so good and hearty! I just love mushrooms, and this is a great way to enjoy them! I just made these….they were awesome! I baked some yellow pepper, sliced mushrooms and onions with olive oil and Penzey’s sandwich sprinkle. Yum! Then I added some cooked bacon (already had it), chopped fresh tomatoes and shredded cheddar cheese to my wrap. It really was lovely! thankyou very much, I am obliged to say your blog is amazing! Healthy and delicious – my favorite combination! Made it for lunch today, for my and my parents. They loved it, and so did I. Delicious! I put in some lettuce before wrapping as well, and it went nicely with the rest. that’s wonderful to hear, thank you!